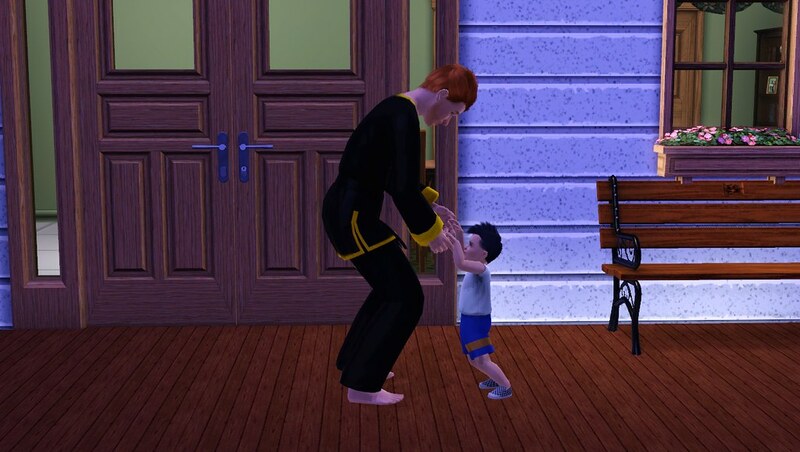 Haruo (Dad) and Alanna - teaching her to walk. 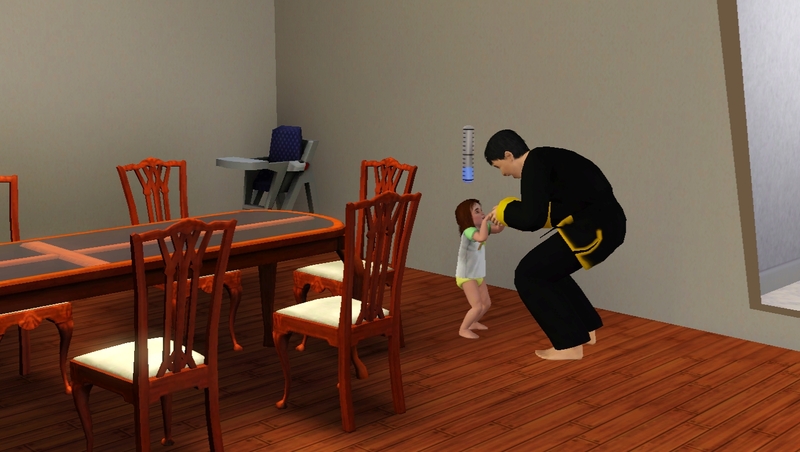 As surrogate Dad (and River as surrogate Mom) to Molly's daughter Sandi - teaching her the ways of Sim Fu. Even a teen daughter needs some hugs from her Daddy. 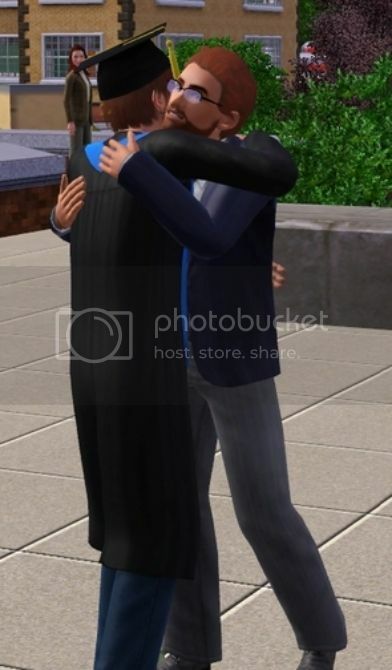 Alanna (as a teen) hugging her dad. River (Alanna's Mom) and Alanna watching Dad play the piano. 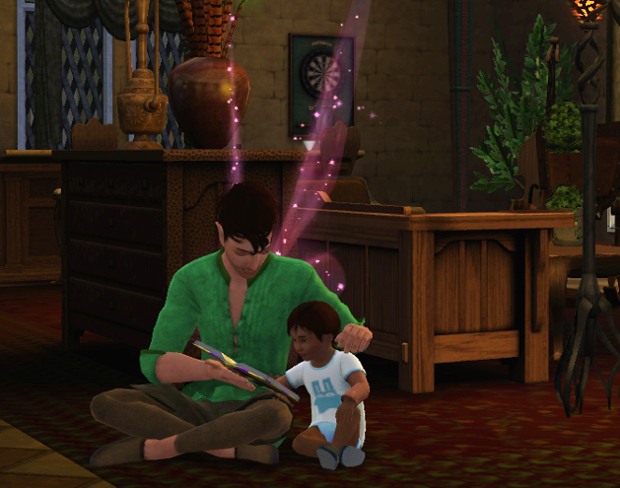 Sweet topic, and awesomes all around for adorable screenies! @Mikezumi. 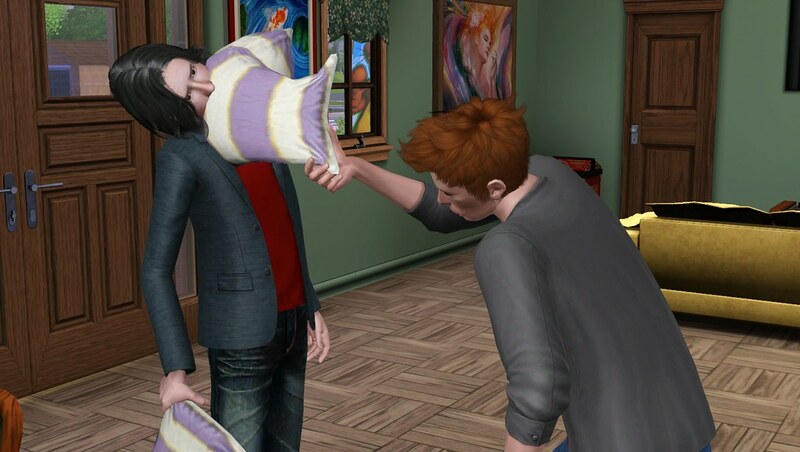 Your Sims pillowfights are epic. Jake and his little girl Erin. 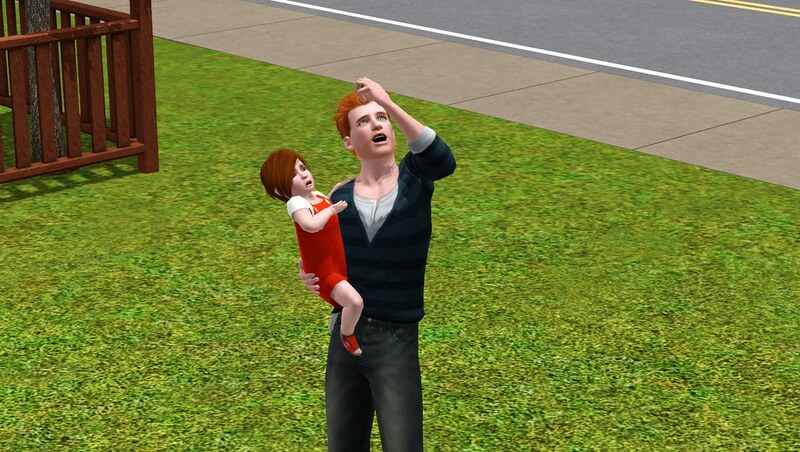 His wife had just been killed by a meteor (I decided to just roll with it) and he's probably wondering how he's going to raise Erin all by himself. (Forgive the bad picture quality). 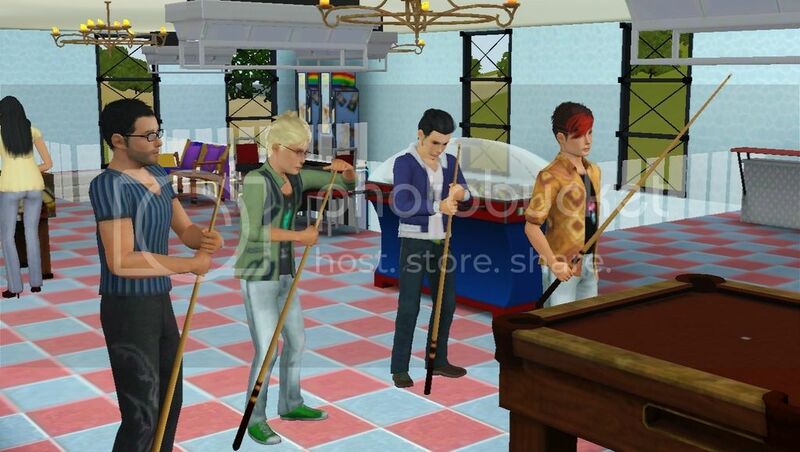 Billy Caspian teaching his teenage sons how to play pool at the bowling alley. @igazor I'd love for you to share more pictures actually! I have wondered this myself! Huh, never realized I was presenting such a mystery here. 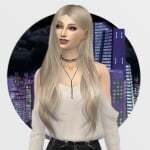 The avatar is the YA version of my self-sim (though I passed that age stage IRL quite a while ago). He only gets played in test games such as the mod testing grounds, together with other NRaas team selfies. It would be too creepy for me to play him or anyone I know "for real." He was also very difficult for me to make, at the time I didn't have the CC tools I have now to better capture several what could be called physical imperfections. 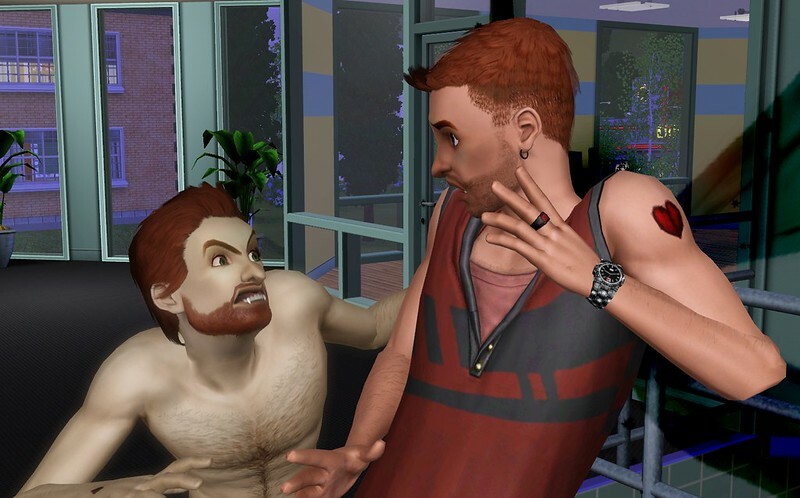 But I think a lot of simmers face that kind of thing when trying to re-create themselves. You guys just made me look through thousands of screenshots going back many years. Many of them are horrible quality, but they mean something to me as long as I can recognize who is in them and what was going on at the time. 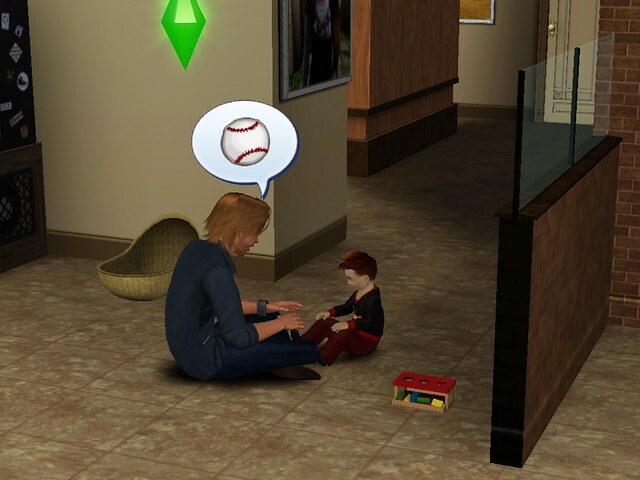 In honor of this thread, upcoming Fathers Day (here in the US), and to further prove that yes I actually do play this game every once in a while, I'll have to sort through them again later when I have more time. 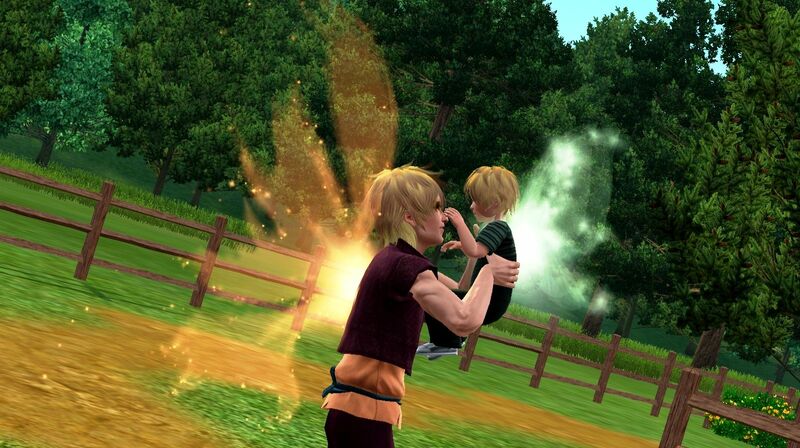 There were actually more pretty decent father-children shots there than I expected to find. Oh I never doubted you really play, you've often mentioned examples that can testify for that I'd love to see your pictures though; screenshots that say 'love for the game and its gameplay' speak just as much to me as beautifully styled pictures. @Mikezumi - "Okay that's it scum, taste the pillow feathers!" 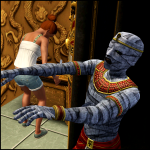 Unfortunately I had to tune out autonomous pillow fighting with NRaas Retuner, seemed that was all some of my sims and their guests wanted to do no matter how many other toys I gave them to play with. I might put it back in again one of these days and tone down the fun relief it advertises, but otherwise having to keep locking and unlocking the bedroom doors sure was annoying for a while. Did you try the deep fryer or icecream maker? 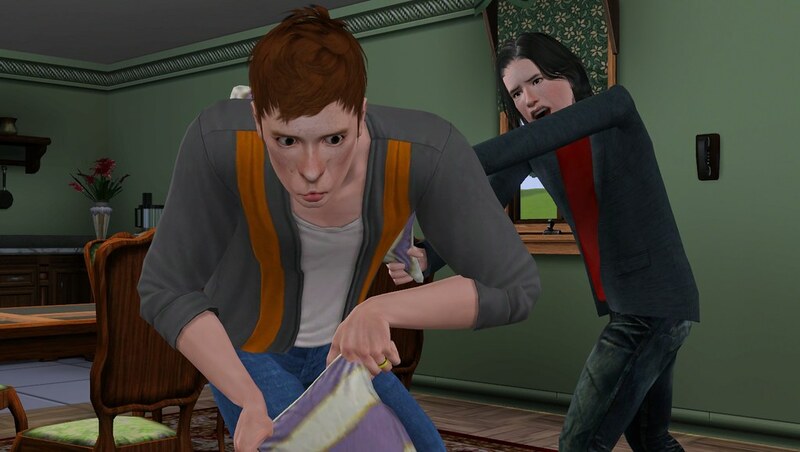 I do have occasional autonomous pillow fights but haven't had a need to turn them off yet but I suspect none of my sims would ever choose any other autonomous activity if they had a deep fryer or icecream maker available. There's nothing like deep fried ice cream. 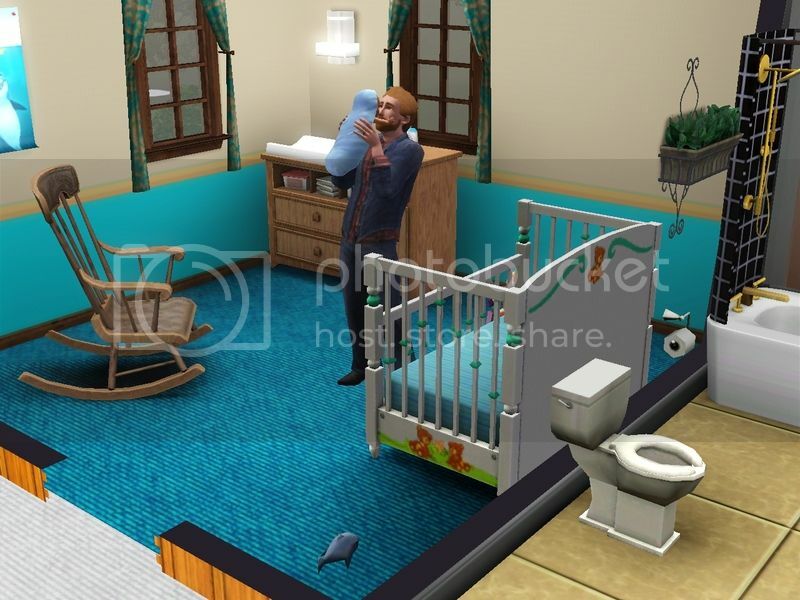 Yes, those are even worse though when it comes to sims being obsessed by them but I hadn't thought of using them to balance out the pillow fighting urges. 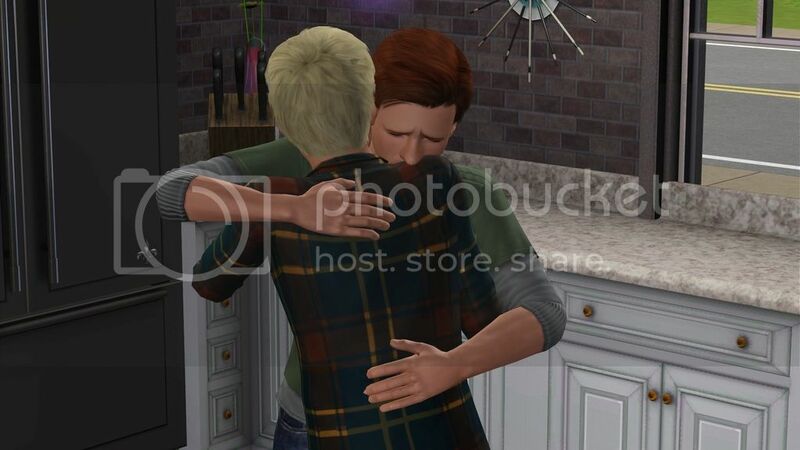 Put those in your sims' kitchen, without Retuner to soften their impact, and you may as well take the doors away because they are never going to leave the room for anything (and soon they will be too fat to fit through them anyway). 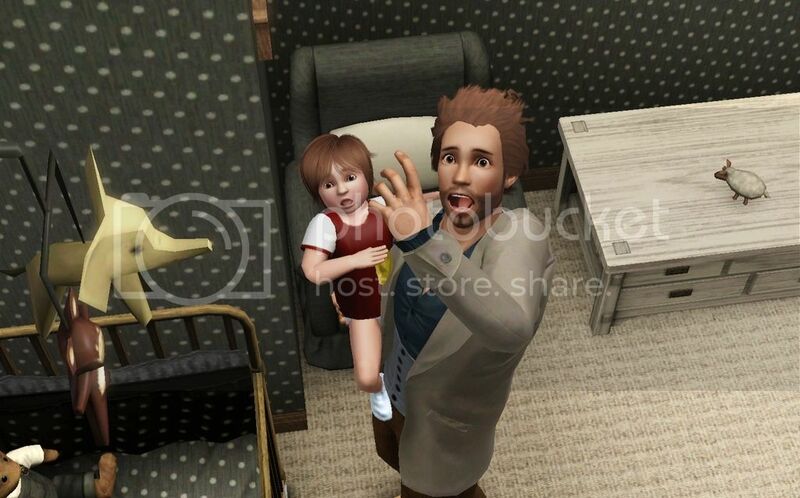 Here are some more pictures of my Sim dads with their children. This is Gobias Koffi with his five children he had with Patience. I think they were living in Dragon Valley. 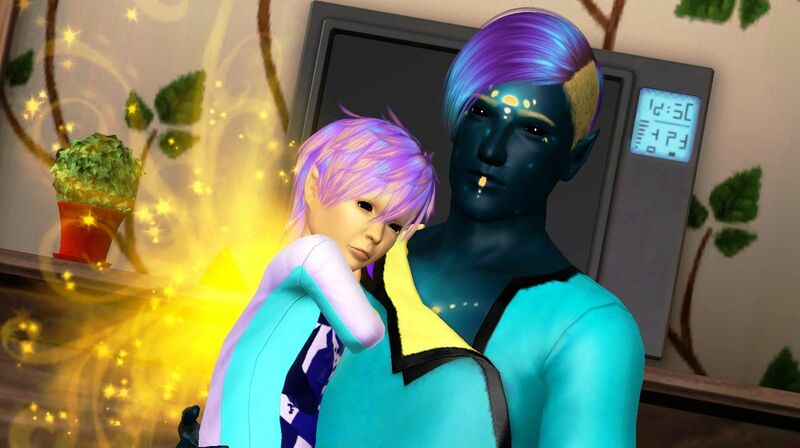 If you saw my previous post you will recall seeing Duncan the genie with his baby son David. Well David's mother, Heather, is half sister to all of Gobias's children seen in this picture. They are all in the same game and have Patience for a mother. They are all in my 'big game' and all are a lot older now. Gobias has died of old age and the others are all married with children of their own. Here they are again. This time they are going to Gary's graduation. By the way, the house they live in is my Magical Brown house and it's in my studio. It has a large basement garden. Gobias and some of his children are witches in this game. 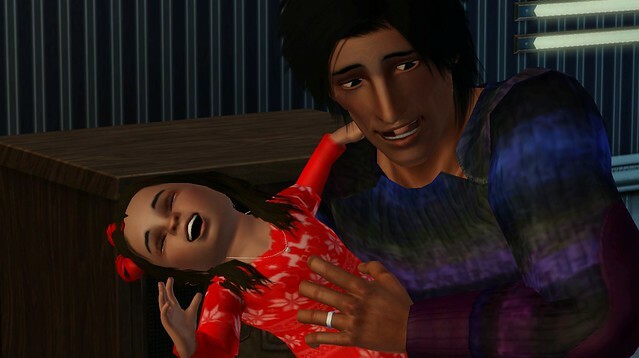 This is Mason Sackholme from Dragon Valley with his daughter Star. He was briefly married to another of Patience's daughters with Marty. Star's mother is Hannah. 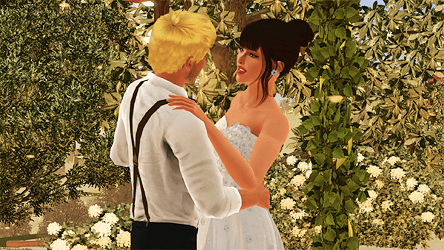 Mason turns out to be a cheater in this game and Hannah walked out on him and married an older man, Quinn Flanagan. They stay married until he eventually dies of old age. 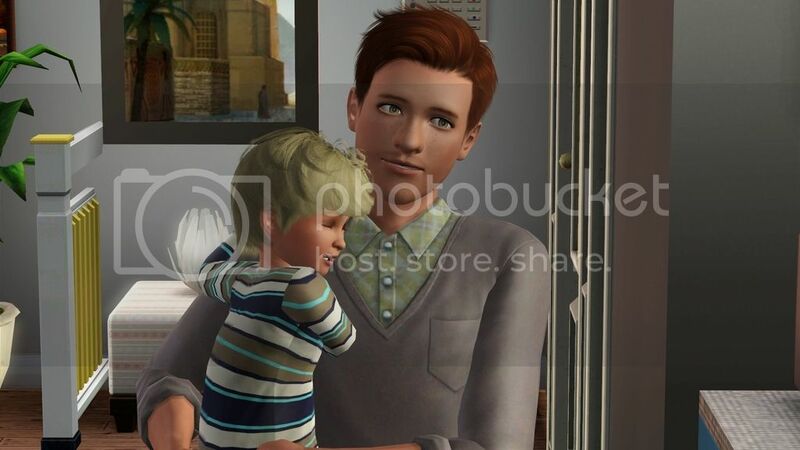 Hannah and Quinn have 3 children together. I didn't spend much time playing their household but did play them occasionally. 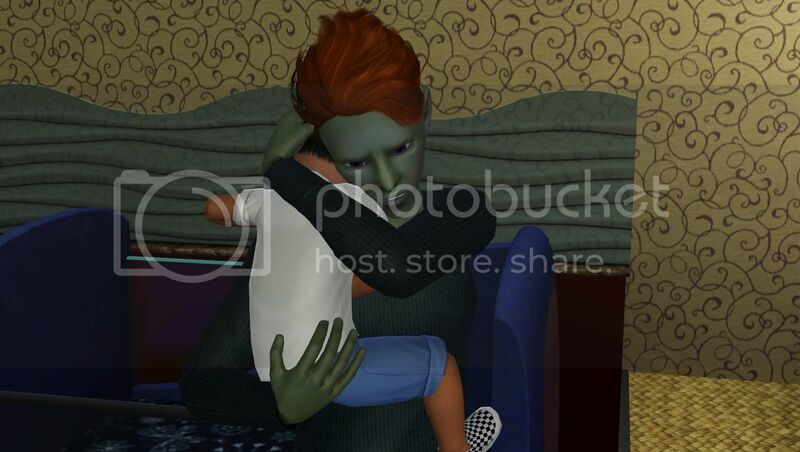 Mason's sister, Susie marries another of Patience's children, Giles. Giles is in the pictures posted above. His father is Gobias Koffi. Giles and Susie have two children. I've mostly left them to get on with their lives all alone. 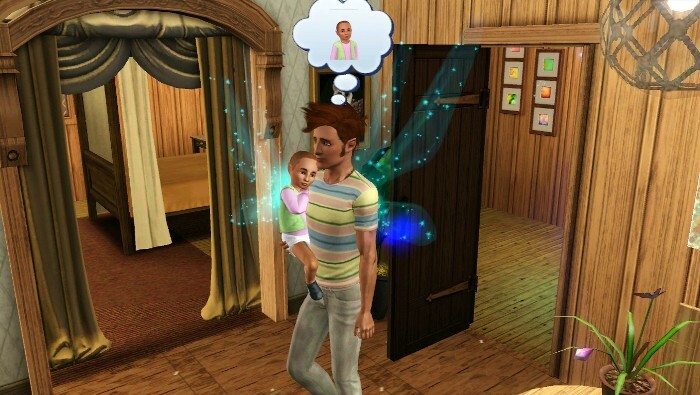 This is my first baby born as a fairy. Nina is the daughter of Lucy, a pale blue genie, and Freddie, a Fairy. I was hoping Nina may be a hybrid but I'm pretty sure she's just a fairy with a pale blue skin. This is one of the families in my big game who are not related to Patience. 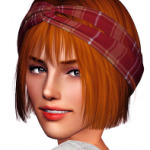 Lucy was with them in the original game and was part of their household in Sunset Valley as a live in babysitter. 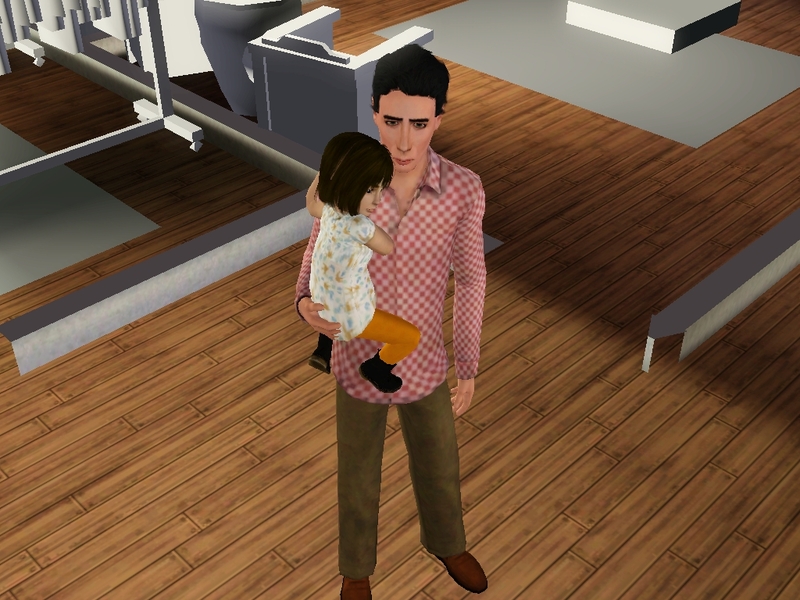 She got packed up with them when I started this big game because she was part of the family and I wanted them to have other sims in the game who were not related. Patience's grandchildren will need to find spouses somewhere. And it was possible that Lucy might marry one of Patience's sons. 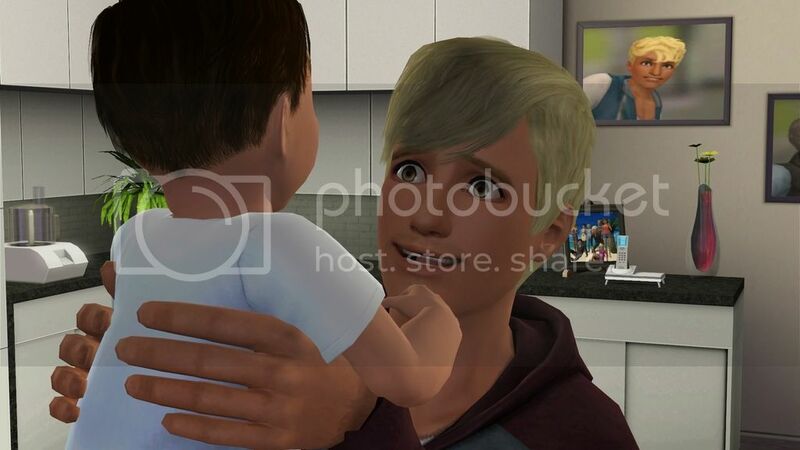 That didn't happen as the game matched them up with other sims. Lucy and Freddy seemed to hit it off and I encouraged their romance with Lucy was getting close to becoming an adult. 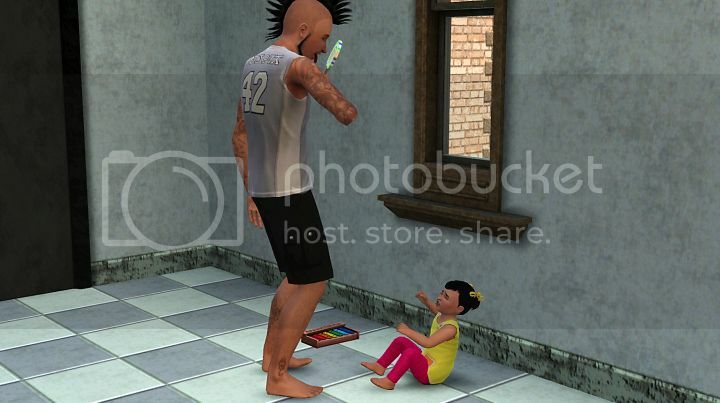 This is Nina as a toddler. 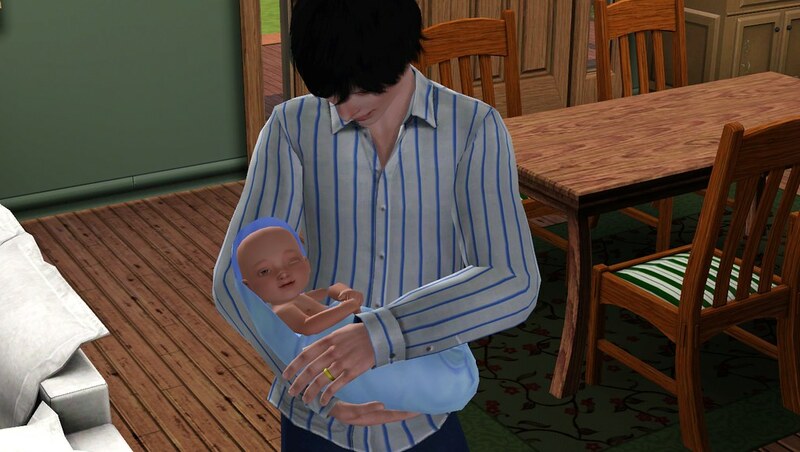 She's still a toddler in the game and she has a baby sibling. They are in Legacy Island III. I will get back to playing them one day as I'm interested to see her age up and become a child. 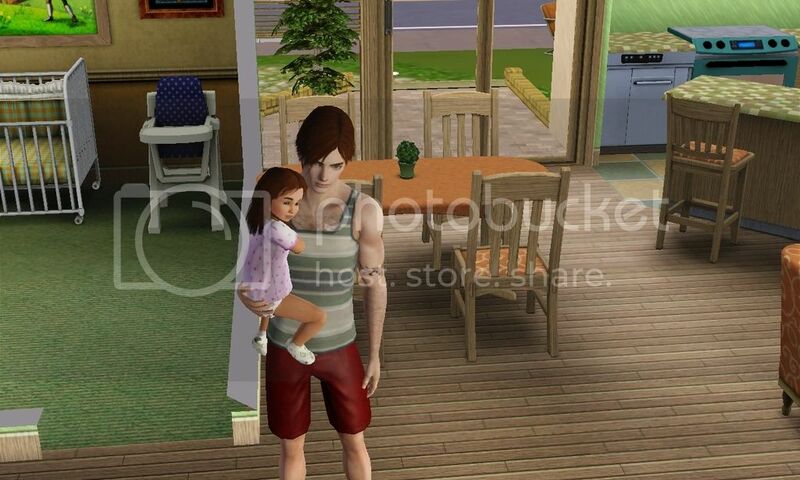 This is Larry Langerak being held by his mother, Carmel. Carmel is a grand daughter of Patience. 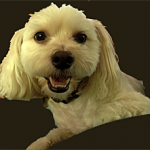 Larry is Patience and Marty's first great grand child. Carmel is married to Parker Langerak. They seem happy but I haven't played them much. Carmel's parents are Ted and Helena Fields. 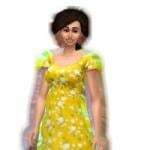 Helena is the eldest daughter (first child ever) of Patience and Marty. Ted Fields and his son Deangelo. 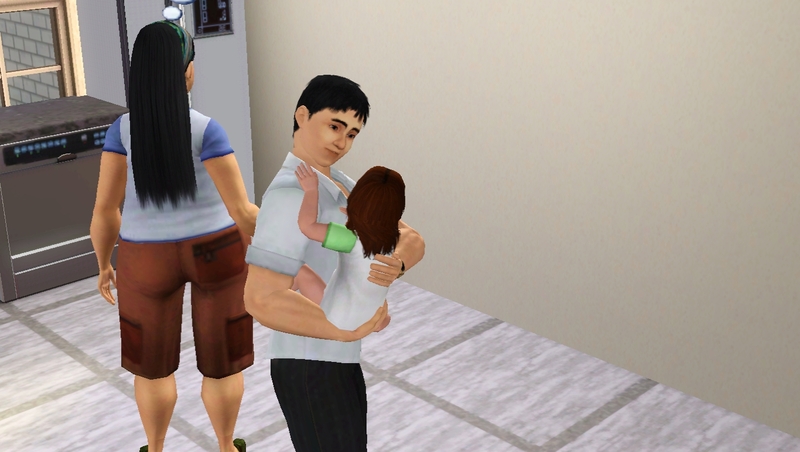 Deangelo is Patience's and Marty's first grand child. Deangelo's mother is Helena, the first child of Patience and Marty. Deangelo is the older brother of Carmel who was mentioned above. Kearney O'Shea and his son Stanley. 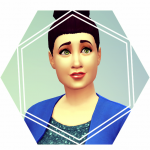 Kearney is from Dragon Valley and is married to Gloria who is a daughter of Patience and Gobias. There is a little brother for Stanley now and they are teens in the game. I think I've done enough for now. Maybe more later. 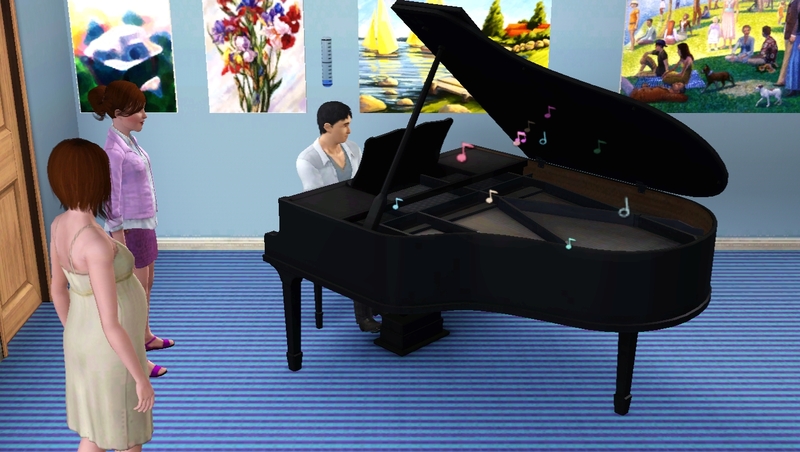 Happy Simming. 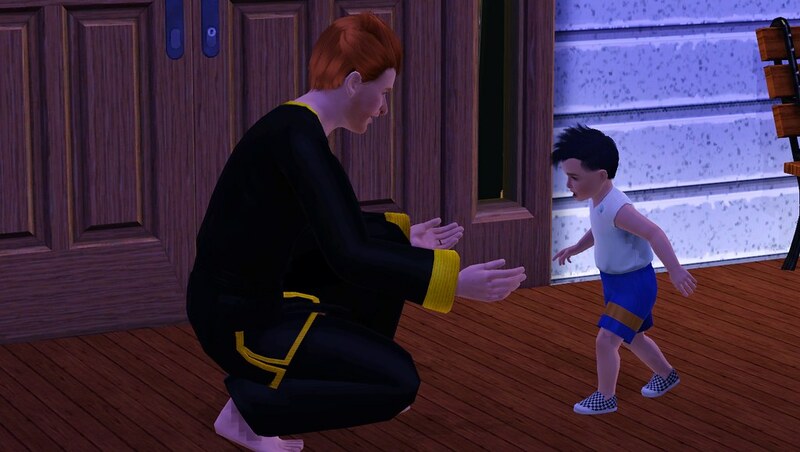 A few more of my sims Dad's and their kids. 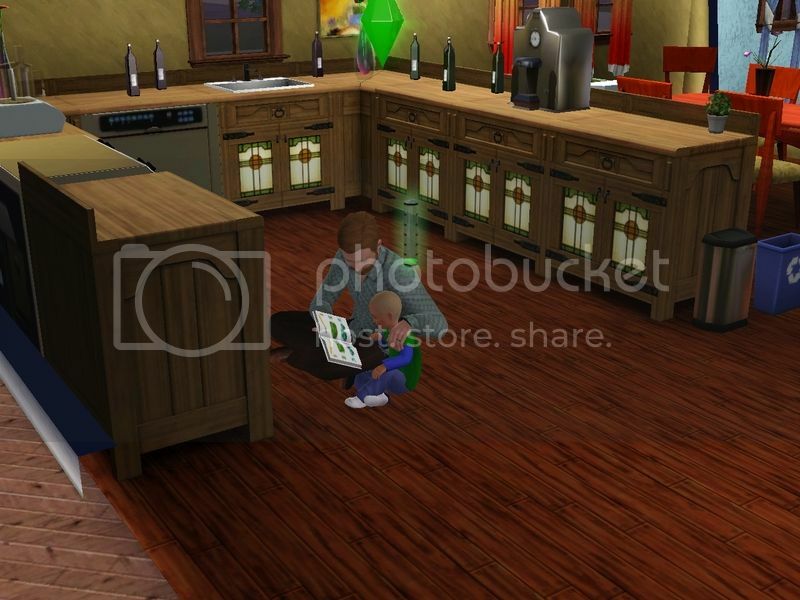 As I am looking at the pictures it really makes me want to go back to those saves and play the families again. I rarely have families, so don't have many or any really good pictures to show, but wow, these are all awesome you guys! So lovely to see Dad's and their kids. And @igazor, it's really nice to see some pictures of your game too - I'd love to see more as well. 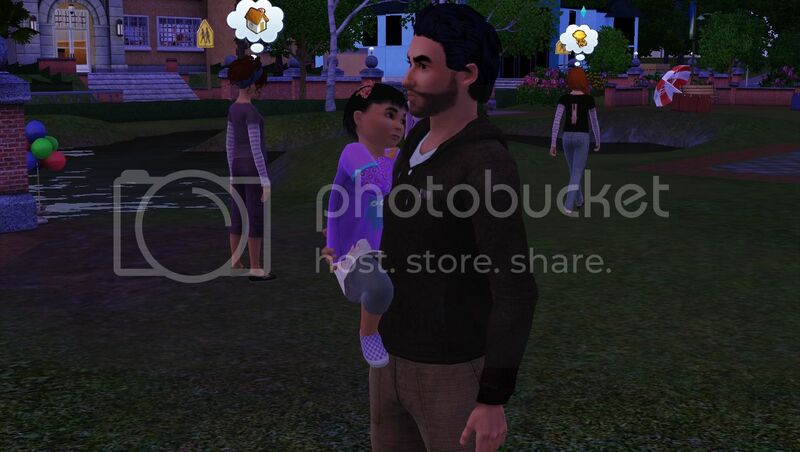 Here is a picture of Lia and her elderly Dad, Leonardo, who lives with her. 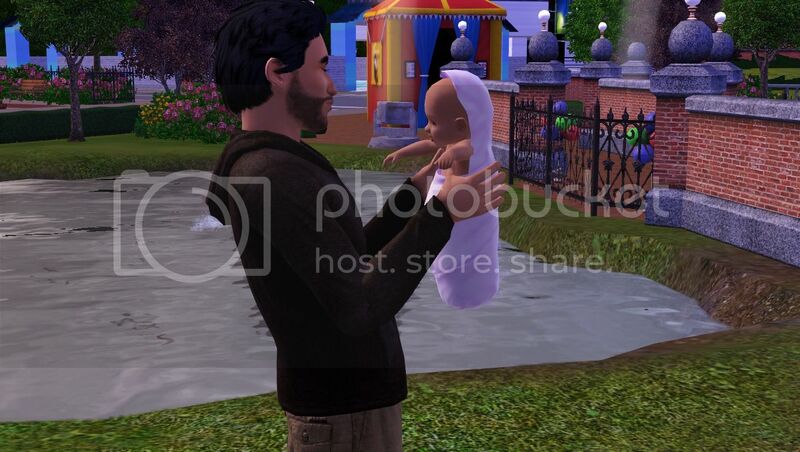 There are lots of good shots here of Sim dads with their offspring. Here's a few more of mine. I have lots. This time I've chosen to focus on Gene - a witch who has had a lot of babies by many different means. There was the alien abduction, plant sim, clone from DNA sample and try for baby. I don't think he's adopted any yet. This is Gene with Sophia. They now live in my Witches Village that I made in Dragon Valley. It is also part of my big game with Patience and her descendants. The witches aren't related to Patience. Sophia's birthday. She is now a toddler. Gene is enjoying a piece of her birthday cake. 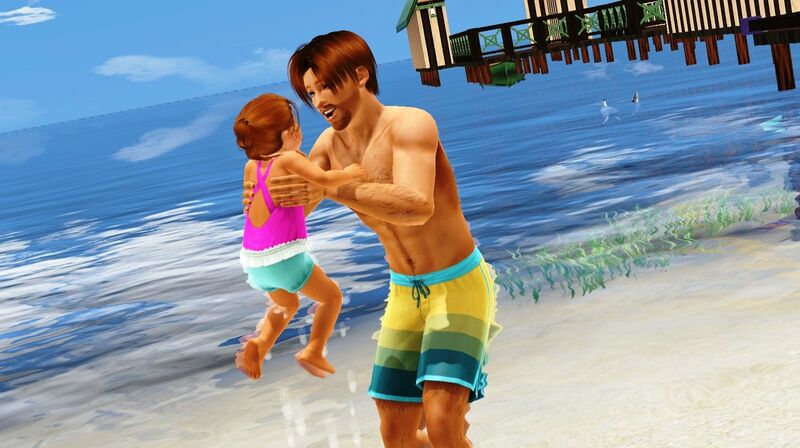 Gene teaching Sophia to walk. 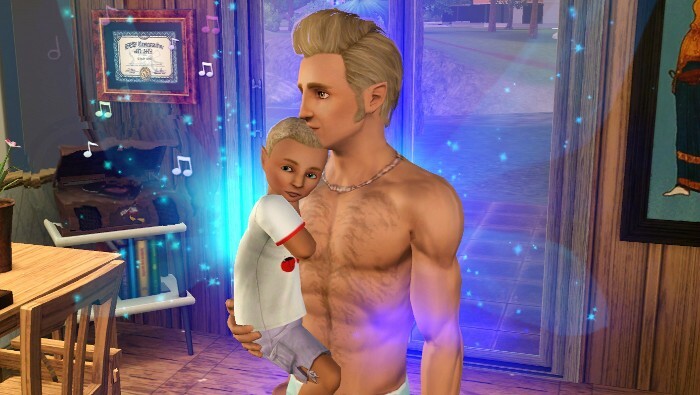 Gene and Belinda - the daughter he cloned by using Bunnie's DNA. He's thinking of Annabel. Annabel is a genie/fairy. Gene also cloned himself, Valmae and Bess. I didn't get him with ALL of his various offspring so some a missing but there are a lot of pictures here. Gene with Britney and others at Britney's birthday. Britney is another clone. I think he may have cloned her from Bess's DNA. I think James is the clone of Gene. I didn't find any other pictures of him with Gene. I got Gene and Annabel to have a few babies to see if any of them inherited her skin. But so far they've all got Gene's skin. Gene and Joseph. 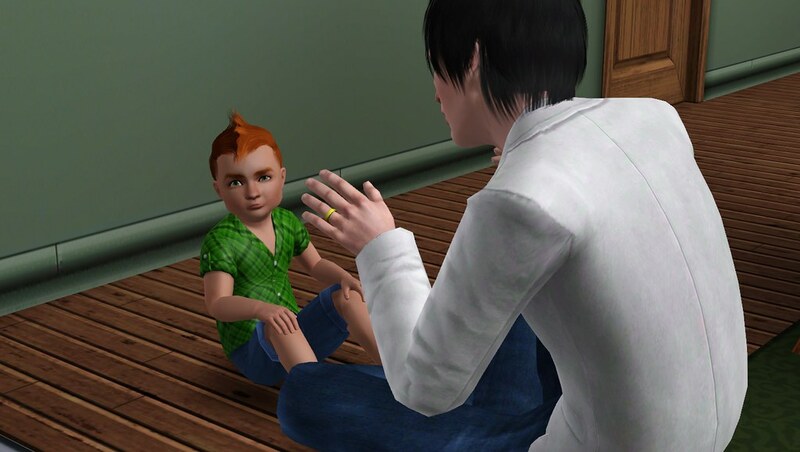 He's talking to Valmae. 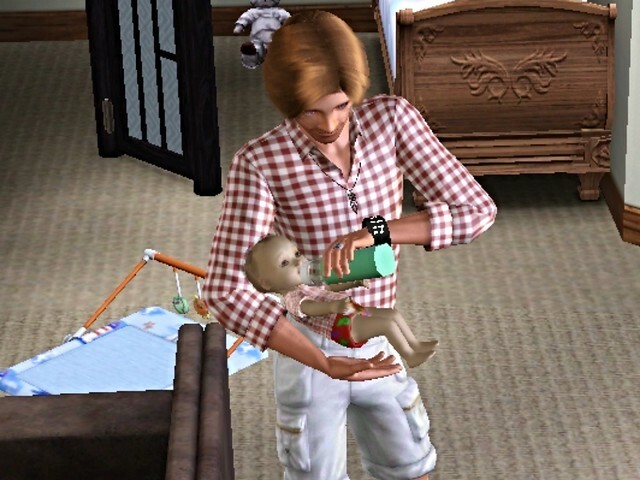 He has also cloned Valmae and had a tfb baby with her too. I can't remember is Jasper is the clone of Gene or if he is a child Gene had with Valmae via tfb. I think James is the clone of Gene and he's evil. 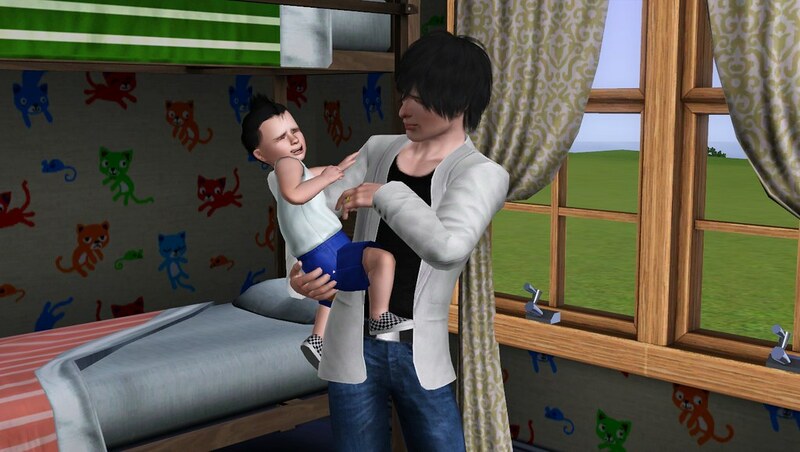 That Simbot, Regan, is also a 'child' of Gene's. I think that's James as a child standing in the background. Britney, Sophia and Jeremy. You can also see Bernadette in this pic. She's a child Bunnie had by tfb with an alien - she captured and seduced the alien after he returned her from an abduction. 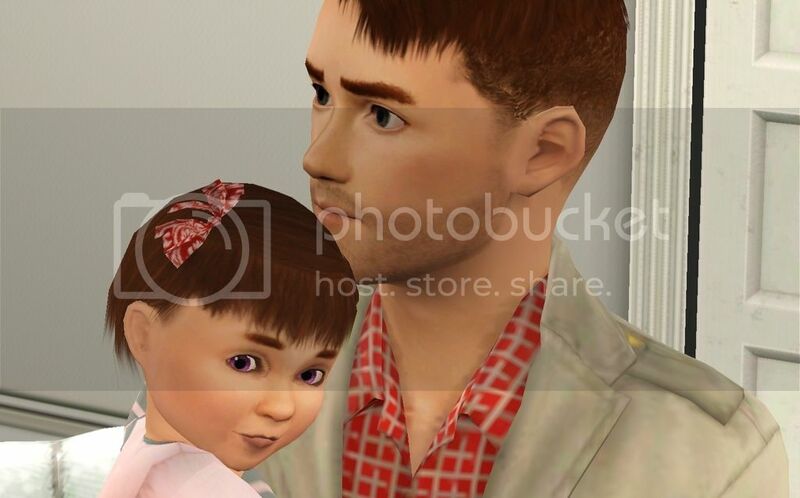 I concentrated on getting head shots of the children as they aged up. I included a few of them so you can see them growing up.